Kristi in Tadasana, the mountain pose. When I was a teenager, over forty years ago, I learned to do yoga at a neighborhood YMCA in Chicago. It was not a part of my life again until my husband Arthur, our dog Sweetie, and I moved to Punta Gorda. Before moving to Punta Gorda, I worked for a living; first, practicing law as an employee benefits attorney for eighteen years. After 9/11, my life changed course and I went to rabbinical school. I became a conservative rabbi in 2009. Arthur, Sweetie, and I had a pulpit in a small synagogue in Rochester, New York for three and a half years. In March of 2013, I had a stroke and our lives changed again. I was physically, emotionally, and mentally exhausted. I started practicing yoga when my therapist gave me a pass to The Yoga Sanctuary. I had ignored my health for the past ten years and was hoping yoga would help me get started on a path to healthier living. Yoga worked for me, big time. I started out with Restorative Yoga once a week. Next, I added Gentle Yoga classes once or twice a week. Now I am doing Level 1 classes four to five times a week. I have tried Mixed Level classes, but am not quite there yet. When I began practicing yoga at The Yoga Sanctuary, it felt like my joints had rusted over. I had no energy, was mentally impaired, and seriously depressed. But I put myself in yoga’s lap. At first, I began to feel better physically, had more energy, and looked forward to going to classes and being with people. I can remember not being able to follow directions, but all of the yoga teachers were patient and kindly helped me fold my blanket or my body in the right way. Now yoga feels like breathing—in fact, in large part, it is! For me, the benefits of yoga are incalculable. With the love and support of Arthur, therapy, doctors’ care, and yoga, I am recovering my health. When I feel my aches and pains, I use yoga postures and breathing to relieve them. I am happy and am participating in our local homeowners’ association and am looking forward to doing a Passover teaching at our synagogue in Chicago in April. Mindfulness training is also really helping me cope with where I am and to focus on what I can do instead of what I have lost. I am able to see a future and would very much like to continue exploring how I might be able to bring some of the benefits of yoga and mindfulness training to others who may be in my own predicament. We’ll see how this evolves. Although I am sometimes depressed by the yoke of being “me,” yoga and meditation are restoring my confidence in myself. 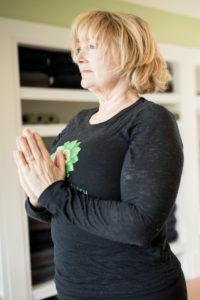 I am learning to mindfully address the natural physical challenges of aging, such as arthritis and hips that simply won’t open up all the way. I am also learning to accept the losses I have sustained as I rebuild and retain my ability to focus and learn. Fortunately, I have progressed from feeling awkward and uncomfortable in restorative postures with plenty of props to looking forward to relaxing as well as being challenged by some of the more vigorous work in yoga class. Outside of The Yoga Sanctuary, I now study, walk, play mah jongg once a week, and work part-time. I keep the books for a small research company, Visual Awareness Research Company, Inc. I have a sister who invented a method of identifying at-risk senior drivers and, in most cases, can help seniors and others with cognitive decline speed up the ability to process visual information. We formed a company years ago to make this helpful tool available to people. I also take pictures of Arthur’s vast poster and contemporary art collection, which he is in the process of selling off, piece by piece, on the internet. In my spare time, I struggle with writing and rediscovering my voice. My favorite yoga pose is Legs Up the Wall. It clears my mind, relaxes my lower back, and makes me feel calm and peaceful. The practice of yoga has become a part of my everyday life. Yoga classes add a sense of discipline and community that I cannot access on my own. I very much like being part of a group where the members are seeking to be healthier and lead more meaningful lives. My favorite quote is, “Great spirits have always encountered violent opposition from mediocre minds,” by Albert Einstein. Sometimes we are afraid of what we don’t understand. Embracing a state of openness and not knowing can often illuminate our way.